In college, there's many occasions to show school spirit and with March Madness happening I thought it would be fun to show you one of my game day inspired looks. Mind you, I'm not that into athletic wear so I thought I show you ladies a much more fashionable version to wear to the office, work, and school if you feel like showing school spirit while being a little more dressed up. This outfit took little time to pull together with my school colors being maroon, grey, and white. 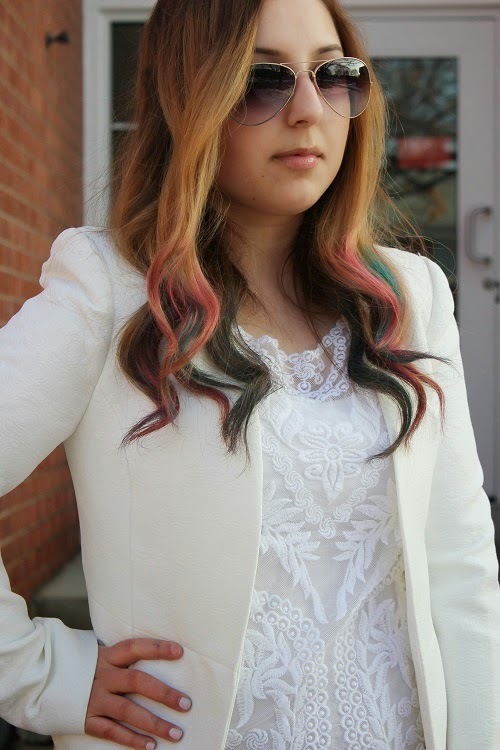 You can totally recreate this look with your school colors easily! Of course the highlight of this look is my colorful hair! What's game day without some crazy colored hair to show off how much of a true fan you are? 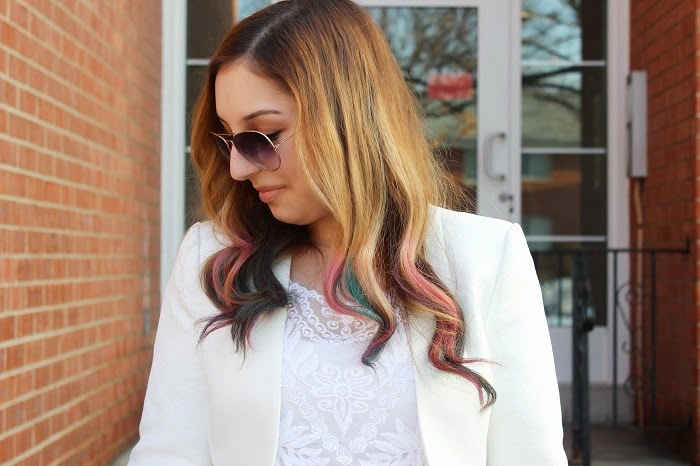 I used Garnier's Color Styler which comes in a variety of different colors and is washable! I decided to not dye my hair my school colors and instead go all out and use pink, purple, and blue just on the tips. Although I'm no stranger to dying my hair, this was my first time dying my hair crazy colors and I can honestly say I love the result! I wish I can have my hair like this everyday yet sadly I have to wash it off for work. Oh well, at least dying my hair these colors was super easy! 1.) Start with dry hair (yes you heard right!) and with gloves on, pour some hair dye onto your hands. 2.) With your fingers, start by applying a light coat on the tips of your hair and wait for it to dry. 3.) If you want to have the color really bold and bright, put a second coat on and let it dry again. 4.) Once your hair is completely dry, brush it. I was shocked at how easy it was to dye my own hair and how pretty it came out. I used the colors Purple Mania, Pink Pop, and Blue Burst although sadly the purple didn't show up too much since the bottom portion of my hair is so dark. I only did one coat of each of the colors cause I wanted something more subtle so that might be why. I'm sure it would show up much easier on someone with a lighter hair color. The blue on the other hand looks more like a teal which I love so it varies between hair colors. The best part is that if you mess up you can easily wash it out! To help you create your own game day look, I included a coupon at bit.ly/garniercoupon to purchase the Garnier Color Styler at a discount! 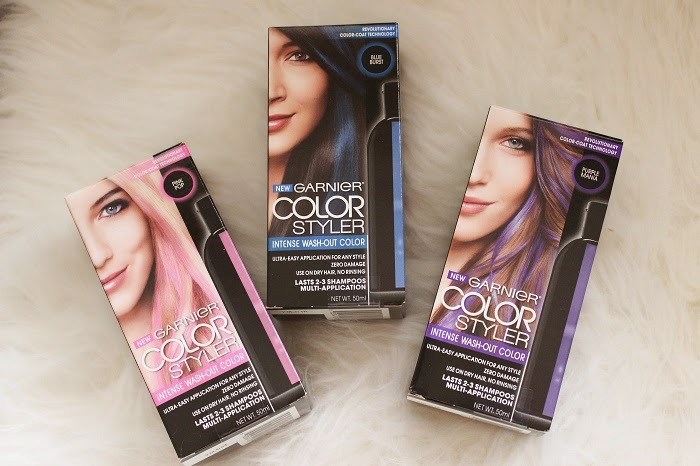 Make sure to show me your looks on social media by tagging @GarnierUSA, @HerCampus, and #colorstyler. Your hair looks super cool! I love the colors! Your top is beautiful. 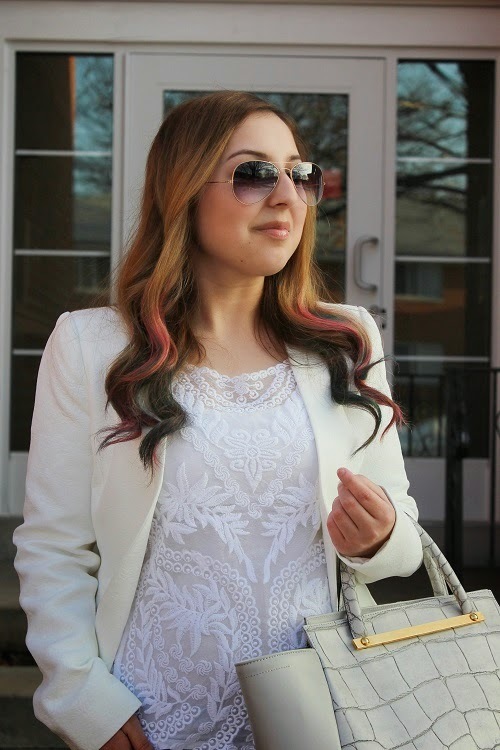 I love the white on white but I'm obsessed with blazers! Does the color transfer onto the white clothes? Love the hair! So fun! Great pants! I host a link up every Wednesday (still live) stop by if you get a chance.